What exactly is Kitchen Tips Thursday, you may be asking? It’s when I am too busy to get the post up in time to call it Kitchen Tips Tuesday! Better late than never, right? 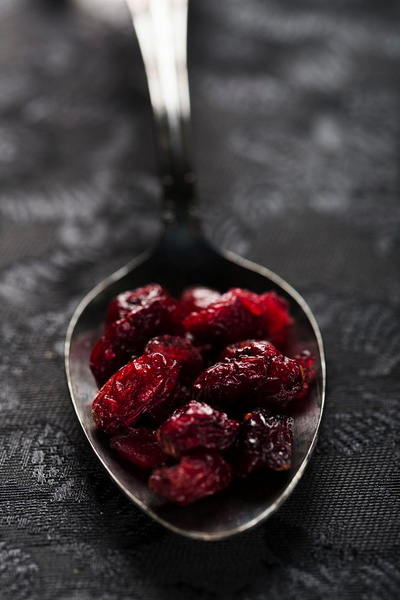 Today’s tip is about using dried fruit in baking. Before you stop reading, this isn’t just about fruit cake. In fact, I have never made a fruit cake, nor have I even considered it. I do however make delicious scones, and oatmeal walnut cookies, both of which use dried fruit in different ways. 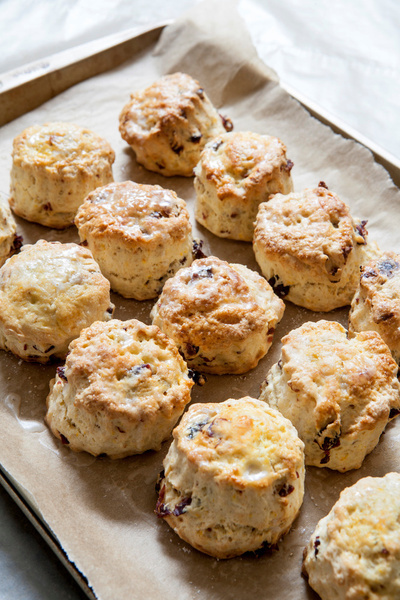 For the scones, the dried fruit (usually cranberries, but sometimes raisins, currents, dried cherries, dried blueberries or combination there of) are tossed in flour before being mixed into the dough. This is to keep them separated, and prevent them from getting sticky. This technique is often used in muffins when the fruit is fresh, as in the case of blueberry muffins, for example, to allow the fruit to disperse within the batter, rather than drop down to the bottom. Both of these items have heartier dough, and allow the fruit to become imbedded into the scone or muffin, thus protecting it from the heat of the oven. The opposite is the case for the cookies. My recipe calls for the dried fruit ( they use the classic raisins, but I make mine with cranberries) to be soaked in lightly beaten eggs and vanilla for an hour before getting added to the dry ingredients. This makes them plumper and prevents them from sucking the life out of the delicate cookie dough during baking. 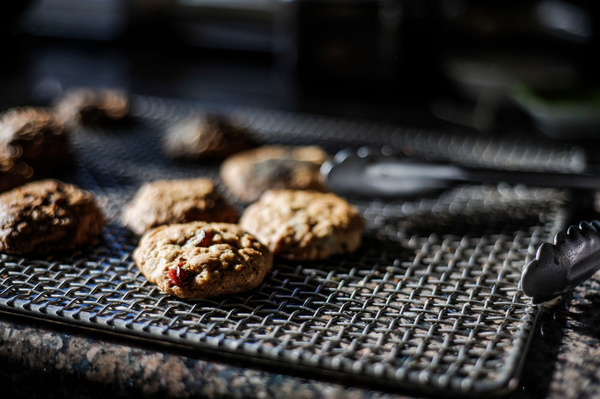 A very dry raisin will try to seek hydration from the moisture in the cookie, and it can also end up almost petrified after baking dries it out further. This method takes a bit longer ( get it started and go do something else for an hour) but it is well worth it for the end result. This entry was posted on December 8, 2016 at 8:01 am and is filed under Food. You can follow any responses to this entry through the RSS 2.0 feed. You can leave a response, or trackback from your own site.